The Sales quote feature in CellSmart POS allows you to provide your customers with a written quote of the costs involved in the services you provide. For example, if the customer has to leave your store for some reason and come back to complete the sales transaction. You can provide them with a sales quote which will include all the details regarding the transaction such as any applied discounts, coupons, sales and continue the transaction when the customer returns. This will provide you and your customer a written description of the sales transaction and help you in keeping a record of each transaction whether it is completed or incomplete. 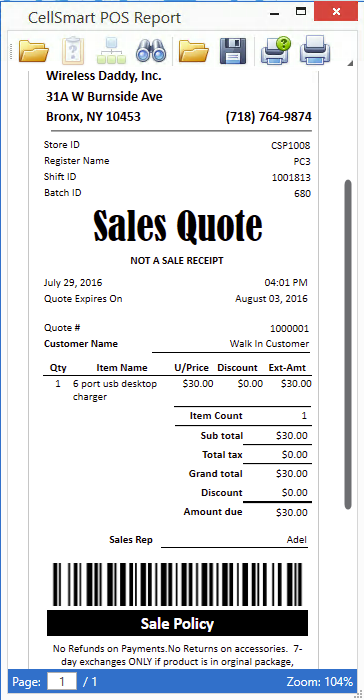 You can provide your customers with a sales quote through the checkout window. Once all the items are added to the transaction and the customer is ready to be checked out, you may click on the checkout button. In the checkout window, click on the Quote button. A message will appear on the screen stating that the quote has been saved and the quote will be printed out to be provided to the customer. Then, click on the Sales quotes icon. A list of all the quotes will be provided in the quote list tab. Select the sales quote you want to proceed with from the list. Click on the shopping cart icon from the options menu to bring the invoice to the main dashboard for sale. Continue with the transaction and proceed to checkout. To view a quote you may select a quote from the list and click on the Eye icon from the options menu to view the quote. Click on the show deleted quote option from the options menu. A list of all the deleted quotes will be provided. Toggle the used/ Available toggle button from the options menu to view the used sales quotes. A list of all the used quotes will be provided.